—a sort of Holy Grail for novelists. Following the success of her previous novels, The Secret Life of Bees and The Mermaid Chair, the Georgia-born author's new book is about two remarkable women and their search for freedom. The Invention of Wings is inspired by real-life sisters and abolitionists Sarah and Angelina Grimke, who lived in Charleston in the 1800s. In her girlhood Sarah was given a young slave named Hetty. Kidd's novel spins off from that point and gives equal time to Hetty, whose desire to have a voice in the world cannot be suppressed. 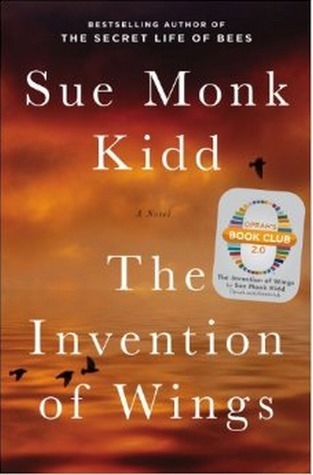 Kidd's recurring theme, about strong women and their need to overcome cultural limits, takes center stage, this time revealing a new understanding of slavery. Interviewer and fellow author Joy Horowitz spoke with Kidd about growing up in the South, the inspiration she draws from her annual Girlfriend Vacation, and how some quilts are like memoirs. Goodreads: What was the greatest challenge for you, a Southern white woman, telling a story about slavery? Sue Monk Kidd: One of the biggest challenges as I worked on the book was this relationship between an owner and a slave. I mean, it mattered very deeply to me that I portrayed this in the right way. I wanted to capture the dignity of Handful [Hetty], this enslaved woman and girl, over the course of this book, which is 35 years. And that she not be entirely a victim, that we see her spirit and we see and feel what it was like for her. I really feel that she rescued herself. She wasn't rescued by Sarah. Sarah had to rescue herself, too. And I think that they helped one another in interesting ways, back and forth. But when it came down to it, that need to read and to find her freedom—that came from inside of Handful. And she orchestrated the plan and carried it out. And that was important for me to be able to say that the enslaved people often rescued themselves. They were not just passive victims. They resisted. They plotted. They did all kinds of subversive things to voice themselves and their quest. And I think we forget that sometimes, and that was an important aspect of it, from Denmark Vesey [planner of a thwarted slave rebellion in 1822] all the way to how Handful and [her mother] Charlotte responded and the nuances of it. GR: Where did the book's title come from? SMK: I love to have a title before I begin writing, even if it's the wrong title. I seem to need it because it focuses me. There were days I could have been writing that I spent imagining titles. Finally one day The Invention of Wings popped into my head—and I knew that was it. Wings could embody this whole quest for all these different kinds of freedom. It was after that that I stumbled upon this African American folktale about slaves having lost their ability to fly when they were enslaved. It's such a beautiful tale, and it's obviously a metaphor. So I began to weave that into it. GR: How much of the story is true about Sarah teaching Hetty to read—an illegal act for which they were both punished? SMK: The novel is what I would call a weaving of fact and fiction. I tried to stay very true to Sarah's life and Angelina's, her sister, because I wanted people to be aware of their amazing life. But I had to graft on a lot of imagined things. The novel is to serve the story, so I tried to bring as much imagination to this as there was history. So it's a big blend, and I really tried to sort out in the Author's Note what was made up and conjured and what was true. Sarah was given a maid in her girlhood. I don't know if it was on her birthday. I manufactured that. But she was given this enslaved girl, probably around her own age. And her name was Hetty. We know this from Sarah's journal. We know that Sarah and Hetty became good friends, at least in a way. At least Sarah felt very close to her. That's how she described it. And the other thing we know is Sarah did teach her to read. She defied the laws of South Carolina, forbidding slaves to learn how to read and write, and they would lock the door to Sarah's bedroom, and they would lie on the rug in front of the fireplace. They even screened the keyhole because it was that dangerous that Sarah taught her to read. GR: Hetty's mother, Charlotte, is a quilt maker. Can you talk about your inspiration for including this craft? SMK: For some reason I wanted a quilt in the story. It started way back with the old Greek myth of Procne and Philomela, which I read a long time ago. It has to do with two sisters, one of which wove her very tragic story in tapestry and sent them out into the world because she lost her voice. Her tongue had been cut out. So that was in the back of my mind. I wanted Charlotte to tell her story in some way, and yet she was illiterate. And then I came upon the slave quilts of Harriet Powers, who was an enslaved woman in Georgia who was born in 1837. Her quilts are just masterpieces of storytelling and narrative. And they hang in the Boston Museum of Fine Arts and the Smithsonian. I made a trip to see the one in Washington, and I was just struck by its beauty. And it inspired me to have Charlotte be a quilter. So I wanted the quilt to be a visual memoir in which she could make meaning of her life and have her life witnessed and tell her story, which I think is very healing. GR: Although it's been 150 years since the Civil War, stories from that time period still resonate. James McBride's The Good Lord Bird, about the antislavery movement, just won the National Book Award. Are American eyes finally open to the truth of their history? SMK: I suspect we have built a kind of insularity around ourselves about this part of our history. It doesn't jibe well with how we like to think of ourselves as a people. And it's painful to look at. In fact, we had 246 years of slavery in this country. I think for a long time we said, Well, it's in the past. It's over. It's done. But there was something festering about that. I wanted to go back to the very roots of racism in this country, and that would be slavery—ground zero for it. And I wanted to look at it. And that legacy has, of course, evolved and improved. We've come a long way. But at the same time we haven't eradicated that legacy completely. There's so much left to be done. GR: How much of Sarah's love/guilt for Handful reflected your own feelings for the African American women from your childhood? SMK: I think that in the '50s and '60s, those relationships were laced with guilt. And there is still a kind of white guilt in America, I think, that also has to be resolved and dealt with, and that makes for awkwardness around these relationships sometimes. But I think back on growing up in the South and observing and witnessing and having my own moral consciousness come into focus in my adolescence. Yes, I think there's a collective guilt about that that's part of the wound of racism in this country—and that's a deep wound. It's part of our collective consciousness as a people. GR: When Sarah makes an important stand and is cautioned not to take it back, you write about the "inclination we women sometimes have to scurry back to safety." SMK: Sometimes it seems we start out and take a deep breath and have these daring moments. And then the internal backlash comes, where the little voices go: Who do you think you are to do that? You can't do that. Maybe you should be safe and don't rock the boat. All these things come up in us. It's not just a matter of taking the deep breath and doing the courageous thing. It's having the resilience to stand by it later when the backlash comes. That seems to be the real work. And it certainly was for Sarah and Handful. GR: Goodreads member Rochelle Kaplan writes, "Your previous novels were set in relatively contemporary times. What made you decide to write historical fiction?" SMK: Mainly because I stumbled upon Sarah and Angelina Grimke, and I wanted so badly to tell their story. But having said that, I think we sometimes tend to see our present so much clearer when we read about our past. I mean, we are a sum of our history, really. GR: Goodreads member Terry Gregory writes, "Hi Sue, you write about strong women in all your books. Are there women in your life or women you admired that give you inspiration?" SMK: Oh, so many. My mother, who is still alive at 92, is an inspiration to me. Her strength. My daughter inspires me a lot. I learn from her all the time. Ann Kidd Taylor. And I have three very close female friends, and we meet once a year for the Girlfriend Vacation, which we've been doing now for 12 years. We don't live in the same place, so we gather. That week we spend together sustains me for almost the whole year. So I get inspiration from them. From the very beginning of wanting to write this novel, I took the idea to this Girlfriend Vacation and they said, "You can do it." And I said, "But I'm so daunted to write about something as big as American slavery." And they said, "You can do it." So we need these voices in our lives. GR: Goodreads member Jeannea Spence says, "Four years ago I began researching my ancestry. I was absolutely distressed to learn that my family had once owned slaves. It caused me to feel an intense pain unique from any other grief I had ever experienced. What was your inspiration for the somewhat similar story line in The Invention of Wings? SMK: That's so interesting how she speaks so beautifully to that particular pain that I was talking about earlier. From everything that I understand about my own family history, there do not seem to be any slaves owned in our family. We were farmers and squatters and didn't have enough money to own slaves. But I think being part of the South, growing up during the Civil Rights era, imprinted something on us. My main inspiration was Sarah and Angelina Grimke. But I'm sure I resonated with that so strongly because they were abolitionists and because the Civil Rights movement of my youth mattered so much to me. And it continues to matter to me—gender and race. SMK: I just bought The Good Lord Bird by James McBride. I'm so excited to read it. And I'm reading The Orphan Master's Son. GR: Tell us about your writing process. SMK: I'm dogged. When I'm working on a book, I write almost every day. If I'm really in the midst of the work, I'll just write straight through the weekend. But I write all day long. I'm kind of slow and methodical and meticulous about the work. I'll take a good long rest after the book tour, anyway. I believe we need a fallow time before we write again. GR: What books have influenced you most? SMK: The novel that shook me and had more impact on me than any novel I ever read was Kate Chopin's The Awakening. I could see something about women's lives that I maybe couldn't see by reading Betty Friedan. I loved The Feminine Mystique, but it didn't shake me as much as The Awakening did. It was a shocking portrayal of what the limitations of culture can do to women and how she tried to respond to that.